Spatial self-organization is the formation of patterns and patchiness in an ecological system by the interactions between the organisms, or between the organisms and their environment. A nice example of this process can be found in mussel beds. Mussels beds shape themselves into a regular banded pattern very soon after the mussels have settled on the sediment. Mussel bed with boat. Photographer unknown. A possible explanation for this pattern is the interplay of facilitation between mussels at short distance by the formation of byssus threads, and competition between mussels for algae in the water acting at larger distance because of the tidal flow of the water. We devised a model that demonstrates that this mechanism is a working explanation. In the movie below, you have a birds-eye view of 25×25 meters of tidal flow where, initially, a thin homogeneous layer of mussels has established. Click on the movie below to see how the bed develops. Of course this is just a hypothetical explanation. Further field study will elaborate on the precise mechanisms underlying the patterning in mussel beds. Van de Koppel, J., Rietkerk, M., Dankers, M. & Herman, P.M.J. 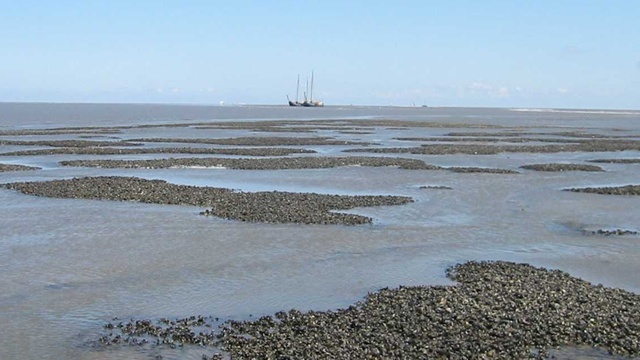 2005 Scale-dependent feedback and regular spatial patterns in young mussel beds. The American Naturalist 165:E66-E77. Link to journal: click!